I have already received business due to my lovely sign, created by the wonderful creative team at Visual Edge. 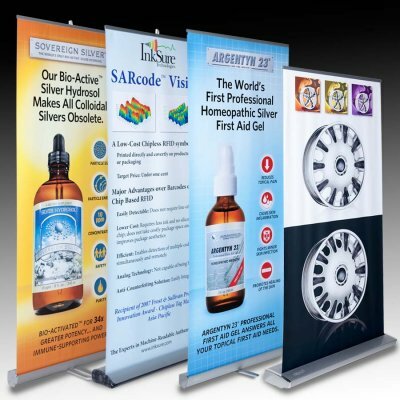 Retractable banners are perfect for tradeshows or even inside the main entrance to your business. We customize each banner to display your message exactly the way you want it. As with any of our signs the proofing process allows you to work with us directly to change layouts, text, styles, colors, logos and photos. The retractable display works very well in a tradeshow environment because of they are portable and have a big impact when you approach the booth. We work to get you the highest resolution photos and the most impactful color schemes in the industry. The end result will be a calling card that announces your presence and sets you apart from the competition. Retractable banners can be customized to a wide variety of sizes and textures. We can print on anything from a standard 13 oz. "No Curl" banner product to a sheer flag material that is nearly transparent. What you do is up to you. We truly customize every job to the individual client. We also have a wide variety of stands and hanging solutions that we offer. We work with some of the largest distributors in the country to provide you with the most current products in the industry. Our color management software ensures that your corporate image will remain the same throughout your displays and literature. We offer table-top throws made from fabric and even your business cards! Our products get you ready from top to bottom and will allow you to confidently sell your services with no worries!